If you’re new to the issues around large scale biomass, or are trying to educate people around you about why it’s important, the award-winning documentary “Burned: are trees the new coal?” (by independent filmmakers, Marlboro Productions) is a great introduction. “Burned” tells the little-known story of the accelerating destruction of our forests for fuel, and probes the policy loopholes, huge subsidies, and blatant greenwashing of the burgeoning biomass power industry. 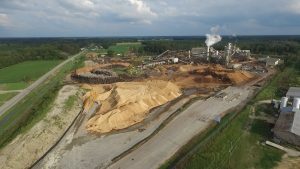 The film focuses on the cutting of forests in the southeastern US, which are then shipped to Europe to be burned primarily in Drax Power Station in North Yorkshire, the largest biomass power station in the world. We are working with the film makers to show it as widely as possible in the UK, especially places affected by the biomass industry. See below for dates of upcoming screenings, or contact us if you’d like to organise a screening in your area or at an event you’re putting on.